A few days ago, we had some friends over for brunch and I decided to serve poached eggs on rice. “Is this going to be raw?” they asked in surprise, as I blithely started to crack eggs over the cooked rice in their bowls. Fortunately, the eggs were actually poached but it made me realize that this method of poaching eggs in their shells is quite unexpected and delightful to many people. It’s also incredibly convenient, since you can make the eggs ahead of time and store them in their shells in the fridge. In Malaysia, a favourite breakfast item is a soft-boiled egg served in a bowl with soy sauce and white pepper. Thick Hainanese toast, grilled over charcoal and lavishly smeared with butter and kaya, a caramelized custard spread, is the traditional coffee shop accompaniment together with piping hot coffee (or more scandalously, the subversive drink called chum, which is coffee and tea mixed together with condensed milk). The eggs are soft set and I’ve adapted a way to cook them from traditional Japanese onsen tamago, where they are held at a low temperature so that the yolks and whites are just cooked. Egg whites and yolks cook at different temperatures, so the textures will be slightly different – the white will be very soft while the yolk will be set like a jelly. I heard that the local kopi tiams (coffee shops) also cook their eggs sous-vide style nowadays in large batches, although theirs seem a bit runnier. I prefer my eggs a little firmer but still tender, and it’s a great party trick to crack open an eggshell and slip out a perfectly poached egg! These are delicious with a dash of soy sauce and freshly ground pepper, or wherever you need a poached egg. Best of all, they can be kept in the fridge and reheated in their shells in a bowl of warm water whenever you need them. Pot size is important! A 1.5 qt pot like this is good. Don’t forget to put the lid on. Bring the eggs to room temperature by letting them sit out on the kitchen counter for a few hours. If I’m making this in the morning, I’ll just leave them out overnight. Put 1 quart (4 cups) of water into a small pot and bring to a boil. When it comes to a full boil, turn OFF the heat and stir in 1 cup of cold tap water. Add the eggs – I like to use a pasta scoop to add them gently – and quickly cover the pot with a lid. Let the eggs sit in the covered pot for about 15 minutes with the heat OFF. If your ambient room temperature is very cold or warm, adjust the cooking time accordingly by a few minutes. After 15 minutes, take out an egg and crack it into a bowl. A perfectly poached egg should slip out. Enjoy plain, serve on top of a bowl of hot rice, or any other way you like! If you aren’t going to eat them right away, put the eggs into cold or ice water to stop the cooking process. This recipe is easily doubled as long as you have a pot that’s deep enough to completely cover the eggs in water. 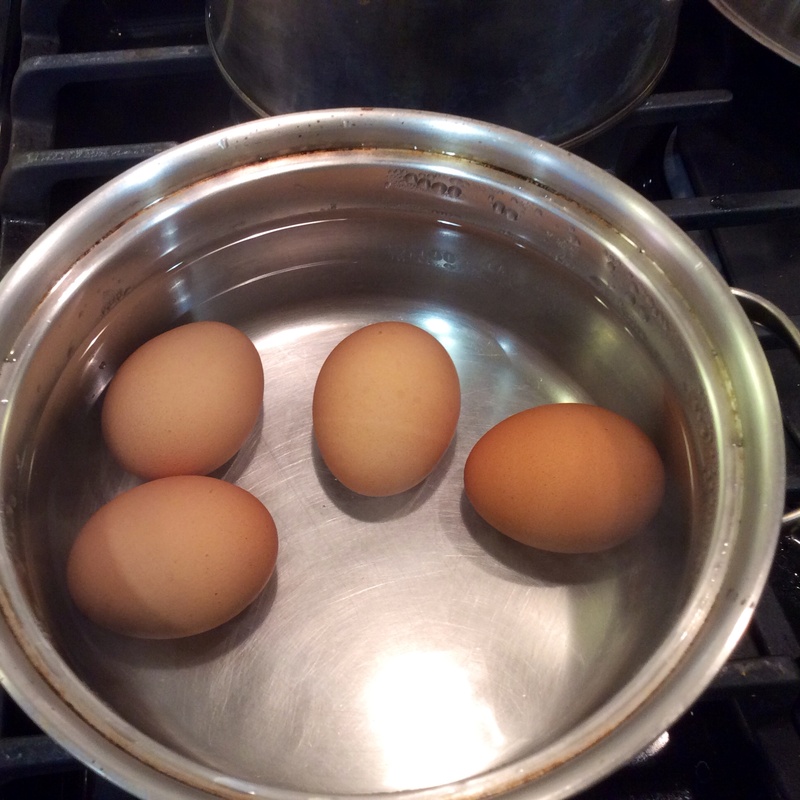 If your pot is too big/has too much surface area, too much residual heat will be lost and the eggs won’t cook as well. There are lots of other ways to cook onsen tamago, most of which involve fiddling around with thermometers in an attempt to keep the water at 140 F for 45 minutes (David Chang’s Momofuku recipe), but my mum has been making soft eggs like this for years without measuring anything, and it’s a lot easier. I shared this recipe in an upcoming fundraiser cookbook for the Friends of the Otis Library, Norwich CT. They will have lots of recipes from other authors as well, and it’s a great way to support a library! If you’ve always wanted to wrap eggs in rice straw, this is the book for you! 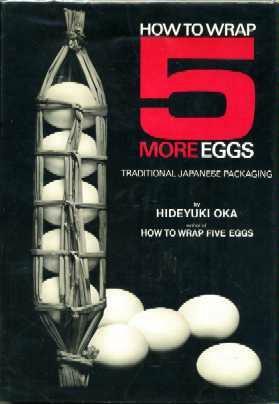 How to Wrap 5 More Eggs – I received this book as a child and it consists of examples of traditional Japanese packaging. It sounds bizarre, but it’s actually a very beautiful book that showcases wrapping styles that are now almost extinct. A great coffee table book. Dress up your soft poached egg by making a fast version of Eggs Benedict – try serving it on a piece of buttered toast, with a slice of smoked salmon and a drizzle of Kewpie mayonnaise with lemon juice. If you have wafer thin sliced onions and a sprig of dill, it will be even better! What’s your favourite way to eat poached eggs? This is magical! Thanks for sharing. I love poached eggs but can never quite get them right. Hooray! I hope it works for you 🙂 The key is to make sure that the eggs are at room temperature (may take a couple of hours) and that your pot isn’t too big. Good luck! Wow this technique for poaching eggs sounds great! Even though I know how to poach eggs the old fashioned way this is going to be the way I do it from now on. It’s great that I can poach them and store them in the fridge for my kids to eat later! Thanks so much for sharing this. I’m also going to buy that coffee table book. I can tell I’m really going to enjoy your blog. Recipes and snacks with recommendations on novels to read them with! So so excited about this. I thought I was the only person who admitted to doing this. Wow! I’ve never heard of this- and will be trying it soon. I get eggs from a local farm and keep them on the counter at room temp…it’ll be interesting to see if they work as well. I’m psyched– I love poached eggs but also have a bit of trouble getting them ‘just right’…. And the idea of serving them over hot rice with soy sauce and pepper…mmmmm…. 🙂 Oh yum. I’m suddenly hankering for half-boiled eggs with black sauce and pepper and a side of kaya toast from one’s local kopitiam…. mmm……. My mouth is drooling at the thought of eating these, but I can hardly count the ways I would be able to do it wrongly and make a hideous mess! The instructions are not correct. I just tried this and it worked perfectly! I think if you don’t add the cold water, the eggs will hard boil in 15 minutes. They were delicious. Had them in some leftover beef noodle soup. It worked! It took me two years from when I first read the post to try it but finally did. We cracked them over hot rice with chopped scallions, soy sauce and sesame oil. My son and I loved it. This recipe is easy and yummy! I love the idea to pre-make the eggs in the morning and keep them in their shell until lunch. Egg shell – “The natural storage container”! No need to wash extra container afterwards and it keeps the egg perfectly moist until I am ready to eat it. Thank you for sharing this recipe. Holy cow! I can’t believe I just discovered this page! Love this recipe and can’t wait to try it out on my friends. Thank you so much for posting these wonderful ideals!